The following profile is a representation of the Wisconsin public education state longitudinal data system (SLDS) as presented through publicly available resources of public primary, secondary and higher education, information made available to the public through the National Center for Education Statistics (NCES), the Data Quality Campaign, published research articles, other third party internet resources (as noted), and direct contact with state and federal public education officials. It is not a formal program evaluation. The Wisconsin Information System for Education (WISE) is Wisconsin’s public education state longitudinal data system (SLDS) managed by the Wisconsin Department of Public Instruction (WDPI). The WISE, created for the purpose of collecting and analyzing Wisconsin public education data at the individual, course, institution, and system levels, aggregates data records from the breadth of the Wisconsin public education systems. The combined data collection systems are part of a nation-wide effort to record granular public education detail over time in order to document the entirety of students’ education experience. This information is intended to be available for analysis and public policy consideration for the purpose of producing improvements in student learning at elementary, secondary, post-secondary, and higher education levels, and to optimize labor market outcomes, individually and generally. Wisconsin is one of the 47 states having received public funding to create a state longitudinal data system (SLDS). Despite state-to-state differences, each SLDS shares a common purpose of supporting research and analysis with the intent of informing individual, household, and public policy decisions based on standardized criteria. This review assesses the overall quality of the WISE as an SLDS by considering the nature of the organization maintaining the data system, those agencies and institutions providing inputs to the data system, and to which agencies and institutions the data systems’ outputs are available. The assessment also considers the data system’s funding mechanisms, internal and external researcher data accessibility, the quality of the data system’s public user interface (dashboard), and the data system’s current Data Quality Campaign (DQC) ranking. This report considers each of these criteria pertaining to the WISE and provides contact information to the departments and individuals who maintain and manage the WISE. In 2009, this committee was charged with overseeing the creation of the WISE and ensuring that the data system met the needs of its various partners and stakeholders in the state of Wisconsin. The committee was also charged with guiding the continued development of the WISEdash website, the online dashboard for the WISE which provides resources and reports to partners, stakeholders, and all other interested parties within the state of Wisconsin. After these tasks was successfully completed, the committee was then charged with maintaining its oversight of the WISE and providing project report updates to the Wisconsin Data Management Steering Committee (WDMSC). The WDMSC is chaired by the State Superintendent’s Executive Assistant and is comprised of management representatives from each program area within the WDPI as well as the agency’s Budget Director. This committee reviews and establishes priorities for all IT projects undertaken by the WDPI and provides project report updates to the State Superintendent’s Cabinet, the highest level of agency management within the WDPI. The WDMSC is charged with supporting educational research and analysis initiatives to improve the state’s educational outcomes. The committee uses the reports and analysis provided by the Wisconsin LDS Executive Steering Committee to identify critical education policy issues and bring these issues to the attention of the State Superintendent’s Cabinet. The WISE receives data records from several key partners, including the WDPI, the University of Wisconsin System (UW-System), the Wisconsin Technical College System (WTCS), and the Wisconsin Association of Independent Colleges and Universities (WAICU). The WDPI provides records through its P-12 longitudinal data system that gathers P-12 individual student level data pertaining to students in the state of Wisconsin. The P-12 data system serves as the foundational structure to the P-16 state longitudinal data system and assigns a unique student identifier number to every student in the state when enter the Wisconsin public education system. This unique student identifier number, termed the Wisconsin Student Number (WSN), remains with that student’s record throughout their attendance in Wisconsin public education. These unique student identifier numbers are generated and managed by the Wisconsin Student Locator System (WSLS). The UW-System provides higher-education data records through its student-level data base, a data system that collects student information from all public higher-education institutions within the state of Wisconsin. 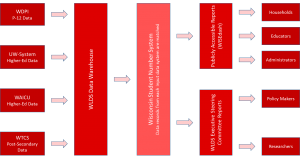 WAICU provides higher-education data records through its WAICU Longitudinal Data System, a data system that collects student information from all private, nonprofit colleges and universities within the state of Wisconsin. WTCS provides post-secondary data records through its student-level data base, a data system that collects student information from all technical colleges within the state of Wisconsin. All education institutions that provide data records to these partners are required to report the student’s full name and WSN if that student attended an elementary or secondary public education institution in the state of Wisconsin. This is a necessary requirement to match the data records provided by each WISE partner and ensure data interoperability between the various data systems. This matching allows the WISE to gather individual student level data on students throughout their education process, creating a longitudinal system that can yield invaluable information to educators, policy makers, administrators, parents, students and other parties interested in the effects of education on the state of Wisconsin. The Principle Investigator must agree to provide the WDPI with a copy of any material created for publication based on the data set prior to its public release. The WISE’s public user portal, WISEdash, is operated by the WDPI for the purpose of providing useful aggregate level data about various education issues to interest parties within the state of Wisconsin. These parties include administrators, educators, policy makers, parents, students and other parties interested in education outcomes within the state of Wisconsin. The quality of the WISEdash portal will be evaluated using several different criteria which include: the user-friendliness of the portal, the extent of data offered by the portal, whether the portal is self-sufficient or relies upon other webpages to provide information, and the extent of customizable reports that can be created using the portal. The WISEdash portal offers user-guide documents and how-to videos to help users successfully navigate the portal. These documents and videos instruct where specific information can be found within the portal and how to effectively use the analysis tools provided by the portal. WISEdash also provides an A to Z index of popular data topics in an effort to help users find information quickly and easily. The majority of data reports contained within the WISEdash portal provide information about PK-12 students. The postsecondary data reports contained within the WISEdash portal only provide information on post-graduation enrollment rates of PK-12 students. The WISEdash portal provides direct access to each of the education category reports listed in the directory home bar. In addition to this information, the portal provides quick links to a number of state, region and national education reports that are relevant to the data contained within the WLDS. The WISEdash portal allows interested parties to create customizable reports about the topics and subtopics listed on the directory home bar. These reports allow users to changes several input variables to specify the type of information they would like to access. Users can specify to what district, grade, and school they would like to examine in a graph, and compare graphs of different groups side by side. A help box is provided to the side of each report explaining what the graph is specifically measuring and what data was used to motivate the report. The statute also describes other requirements for the partners, such as establishing an inter-agency data sharing agreement system, the required protocol that must be followed to ensure student privacy rights and when the partners must submit a joint report to the secretary of administration regarding their progress towards establishing the longitudinal data system. This schematic is offered to provide a simplified, visual presentation of the WISE and the channels through which data flows into and out of the SLDS. The entities on the far left side of the schematic represent the data record providers to the WISE. The entities in the middle of the schematic represent the WISE data system and public user portal. The entities on the far right side of the schematic represent the parties intended to receive benefits from the outputs generated by the WISE.